In a tough and fast moving operational environments, CIOs and HR managers are finding it difficult to balance the demands of their IT needs with the availability of well trained talent. With a shrinking pool of highly trained, available talent, shortlisting, interviewing, selecting, and training IT staff can often be a hit and miss. As a top tier technology services company, PM Global has an impressive record of attracting top talent who are passionate, dedicated and competent in their delivery of services and support to clients and peers. Sourcing, securing and training of IT talent. 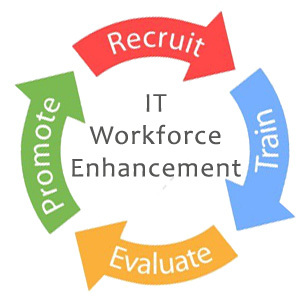 IT staff enhancement with co-location of PM Global talent at your site. To speak to one of our experts about your needs, contact us today.